This month's Ipsy bag was just okay. There were a few products that I liked, and a couple that didn't really end up wowing me much. But overall the assortment of items was pretty nice, and the bag itself is just super fun! Beau Gachis® Paris Smudge Brush: I love when I receive tools in beauty subscriptions, and this brush is no exception. 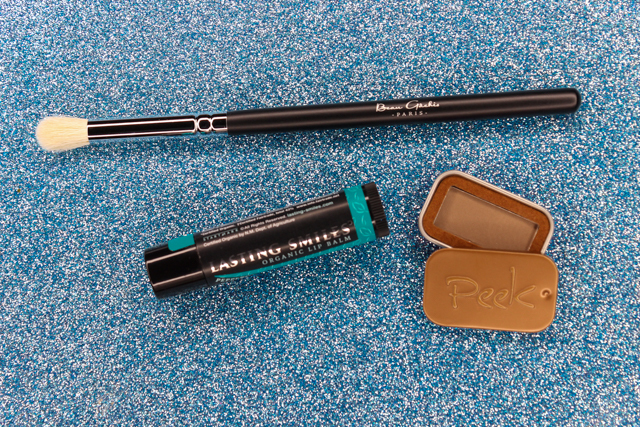 It blends crease shadow colors very well, resulting in a seamless result. Sort of reminds me of MAC's 217 brush. Lasting Smiles Lip Balm in Peppermint Creme: This lip balm contains pure ingredients (peppermint oil, coconut oil, shea, cocoa butter, to name a few) that are sourced from small scale global farming cooperatives. It's organic, cruelty free, and every lip balm purchase helps fund cleft surgeries for children, which is pretty great. I typically don't have much luck with organic lip balms since I find they don't do much for my lips in terms of hydration. But this one is totally different from others I have tried. It's super moisturizing, softening, and it smells amazing. Love! Peek Beauty Natural Stain Brow Powder: This brow powder contains a formula that combines the wear of a powder with a natural stain, that's made from coffee seed oil. There is also rosemary and thyme oils which help condition brows.Unfortunately, this brow powder didn't work out for me. The color us just way too light for my dark brow hairs. Sigh. 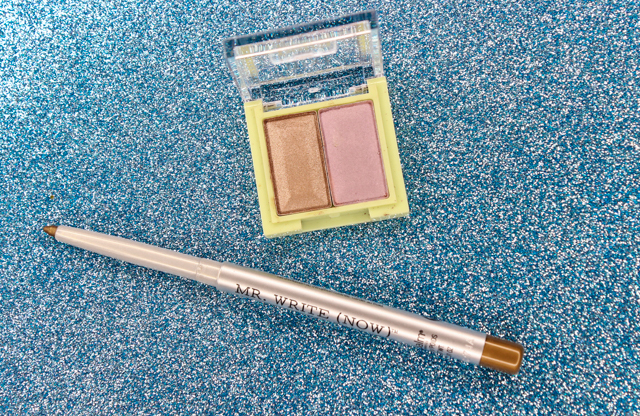 theBalm Cosmetics Mr. Write (Now): This eyeliner pencil is really pretty. It has a smooth texture, it's nicely pigmented, and pretty long-wearing. I don't have an eye pencil with a bronze hue like this one but I have to say, I am glad I do now because it compliments so many neutral eye looks. This color is called "Jac B. Bronze", by the way. Pixi by Petra Mesmerizing Mineral Duo in Lavender Bloom: These eyeshadows are just not my cup of tea. The colors are pretty but, I find that the shadows are too sheer and subtle for me, not to mention sort of powdery in texture, too. I will try applying these wet. Maybe the pigment factor will increase. I just love that bag, so cute! The bag is super nice!